Manage vendors, procured items, materials and purchase terms in one place. Have one list to follow all your purchase orders (POs). 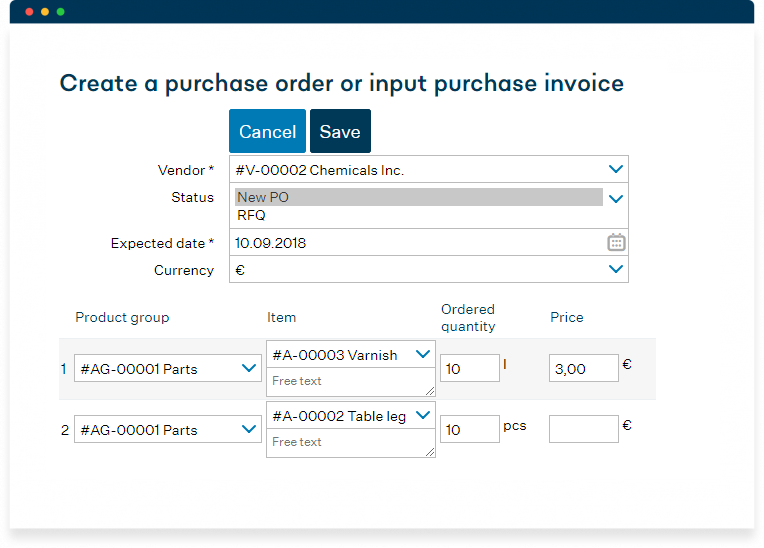 Click “Create a purchase order,” enter the needed parts and their quantity and the PO will be automatically filled according to the saved purchase terms. Download PO in PDF format, or instead, let MRPeasy open your email client with a prefilled e-mail. Report the full receipt by entering the arrival date and the items are automatically taken into stock. Alternatively, report partially received items. Follow the “Critical on hand” report and stay on top of all items that are below minimal stock value and need reordering. 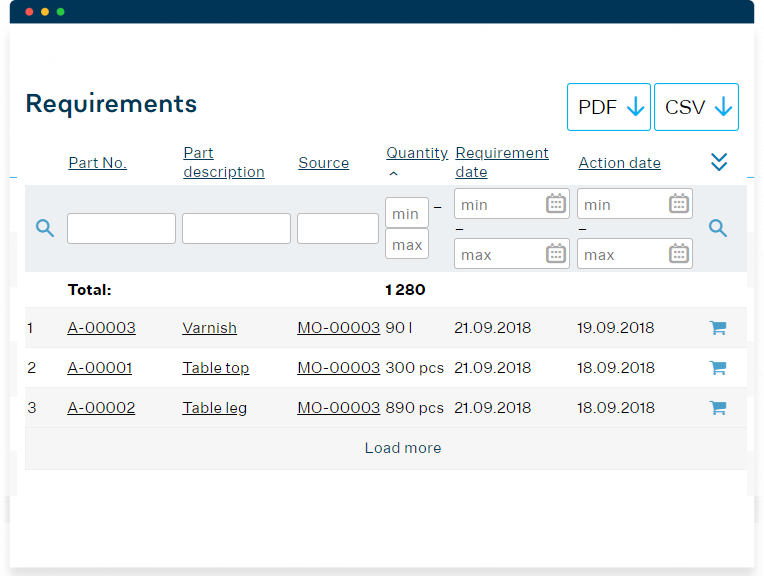 Lets sales or production managers click “Book materials” for customer or manufacturing orders and let purchasing manager follow the demand under the “Requirements” list. 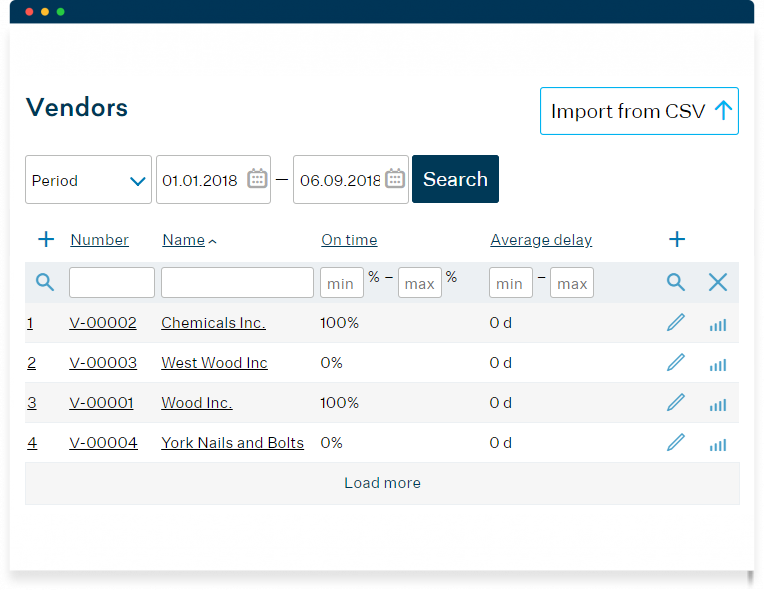 Have your purchase orders, that were created from the “Critical on hand” report, automatically book for the respective order, and have your production planned before the parts and materials arrive. Follow the color-coded warnings when the required parts are delaying. Use “procurement forecast,” which is calculated based on your sales forecast. Run inspection and follow all stock lots that have been received into stock and need to be inspected. Use Return Merchandise Authorization and Quality Control functionality. Import vendors or purchase terms from a spreadsheet. Bulk update purchase terms when the vendor provides a new price-list. Easy RFQ creation and delivery. One click to turn the RFQ to PO, marking items expected into stock and allowing them to be booked for manufacturing and sales. At a glance, this is an overview of the whole business process. Follow COs, MOs, POs, stock levels, invoices, OEE, sales, cash flow. Understand the profitability of manufacturing orders, products, customers, and more. MRPeasy is a cloud-based MRP software for small manufacturers that helps manage production planning, stock, customers, purchases and the team in one place. Just sign up to test MRPeasy, select the features plan that meets your requirements and access additional functionality as you grow your business.